Hamilo Coast is SM Land’s premier residential leisure destination development in Nasugbu, Batangas. Encompassing vast hectares of land, thirteen coves, and kilometers of the finest coastlines in Nasugbu, Hamilo’s long-term masterplan is envisioned to provide a network of leisure communities with a variety of lifestyle experiences. How do I get to Hamilo Coast? Hamilo Coast is accessible by land travel through the traditional Tagaytay route going beyond to Nasugbu, Batangas, which takes approximately 2 ½ to 3 hours. By air on a helicopter, travel from the Mall of Asia Complex in Pasay City will take as fast as 20 minutes. A national highway is being constructed that will traverse Ternate, Cavite going to Nasugbu, Batangas. Once this Ternate-Nasugbu highway is completed, land travel to Hamilo Coast can potentially be reduced to 1 ½ hours only. A ferry transport service is also being developed that will depart from Mall of Asia Complex to Papaya Cove in Hamilo Coast, and vice versa. This mode of transportation will potential reduce travel time to 1 ½ hours only as well. ​What is the weather condition/climate in Hamilo Coast? Nasugbu, Batangas, where Hamilo Coast is located, generally experiences two types of seasons: dry season from November to April and wet season for the rest of the year. January is the coolest month, registering an average temperature of 25.8 degrees Celsius, while April is the warmest month registering an average temperature of 29 degrees Celsius. What makes Hamilo Coast’s location and natural environment special? The Coral Triangle is the world’s center of marine life–a vast, majestic and colorful coral nursery covering 5.7 million square kilometers of ocean, encompassing the islands and waters of the Philippines, Indonesia, Malaysia, the Solomon Islands, Papua New Guinea, Timor-Leste, and beyond. In the Philippines, the Verde Island passage is one of the most significant links to the global ecosystem of the Coral Triangle. Located between Batangas in Luzon and Oriental Mindoro, the Verde Island waterway is the ‘center of the center of marine biodiversity’, describing the density and concentration of its coral and underwater life in comparison to the rest of the Coral Triangle. Hamilo Coast, being situated in Nasugbu, Batangas, is fortunate to be part of the Verde Island passage in the Philippines and of the global Coral Triangle. How is the developer taking care of such natural resources? Given such wealth of natural beauty and resources, SM Land has committed itself to the sustainable development of Hamilo Coast and has made this a deliberate part of its operations and plans. It works closely with WWF-Philippines specifically on three areas of work—coastal resource management, solid waste management, and the development and use of renewable sources of energy. Three of its thirteen coves—Pico de Loro, Etayo, and Santelmo—have successfully been declared as marine-protected areas with the help of WWF-Philippines and the local government. SM Land has also been undertaking proactive measures to conserve and support the environment, such as clam seeding, coastal clean-ups, release of pawikan (sea turtle) hatchlings and identification of adult pawikans, as well as forming bantay dagat or marine patrol groups and cooperatives that support the local communities in order to engage them as stewards of the natural resources. You may read more about these efforts in articles contained in our website. What is Pico de Loro Cove? 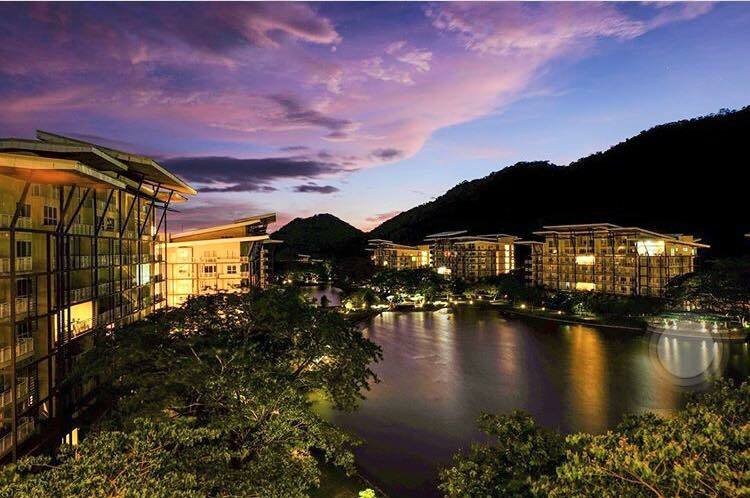 The 37.5-hectare Pico de Loro Cove is the first leisure community to rise in Hamilo Coast. Nine mid-rise, low-impact condominium buildings—along with an exclusive Beach Club, Country Club, and Pico Sands Hotel—circle a man-made saltwater lagoon comprise Phase I of Pico de Loro Cove. These condo vacation homes and exclusive club facilities offer an active and dynamic leisure lifestyle, and have redefined the concept of weekend getaways with convenience, immediacy, and privacy. The Pico de Loro Cove leisure condominium community is composed of nine mid-rise buildings (up to 8 floors), divided into clusters. Each cluster has 2 buildings. Jacana and Myna are the first two clusters launched in 2007, while Carola and Miranda followed in 2008. The remaining cluster is a single building, Amandava, which will be launched in 2011. Units currently on offer in Carola and Miranda are composed of one-, two-, and three-bedroom configurations. Special unit types include corner units, ground floor garden units, lofts/bi-level units, and penthouse units. The centerpiece amenity of Pico de Loro Cove is the Beach & Country Club. This exclusive, members-only club brings the comforts and conveniences of the usual country club into a spectacular beach and mountainside setting. The Beach Club component, located near the coastline, is a more social and engaging venue with its dining facilities and lounge areas. The Country Club offers a recreational atmosphere with its family-oriented facilities, as well as amenities for ball and racquet sports. – Baia ballroom, an indoor venue for functions and gatherings, which can be subdivided for smaller function or conference rooms. Please call the club front desk at 214-7888 for complete details on the facilities and amenities of the Beach and Country Clubs. An exclusive 150-room hotel will provide accommodation for club members and guests, as well as additional amenities such as a spa and more F&B outlets (opening 2011). Who is SM Land, Inc.? SM Land is the property arm of SM Investments Corporation. Under SM Land, SMIC builds its portfolio of property offering, from primary homes and residences under SM Residences (SM Development Corporation), to leisure developments like Hamilo Coast (Costa del Hamilo, Inc.) and Tagaytay Highlands (Highlands Prime, Inc.), and integrated business districts such as the Mall of Asia Complex (SM Land Commercial Properties). Who is Costa del Hamilo, Inc.? Costa del Hamilo, Inc. (CdHI) is a subisidiary of SM Land, Inc and the exclusive developer of Hamilo Coast. 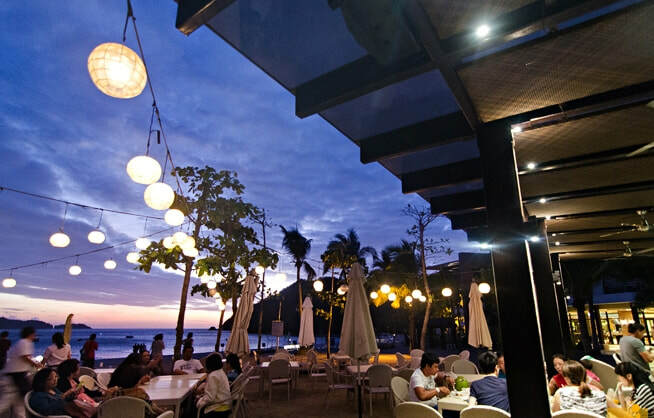 Cap off an entire day under the sun over refreshing drinks, cocktails, savory treats and good music at Pico de Loro. Open your eyes to the world out there and admire what nature has in store for you. 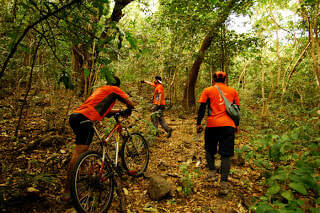 Discover its charm through trekking at Hamilo Coast. Wake up to perfect mornings and witness awe-inspiring sights in the comforts of your beach home at Pico de Loro Cove.